Take Interstate 17 North to Carefree Highway 74. Go west (left) for about 30 miles past Lake Pleasant. This scenic desert highway deadends onto Highway 60 in Morristown. Turn right and go north five miles to milemarker 115 (one mile past the rest area and the next left turn after River Rentals). Look for the colorful banner on the left flying high atop the rocks. Turn left--at the red & yellow mailbox. Look for our copper colored roof and park out front. Go south through Wickenburg and head four miles down Highway 60 (towards Phoenix). 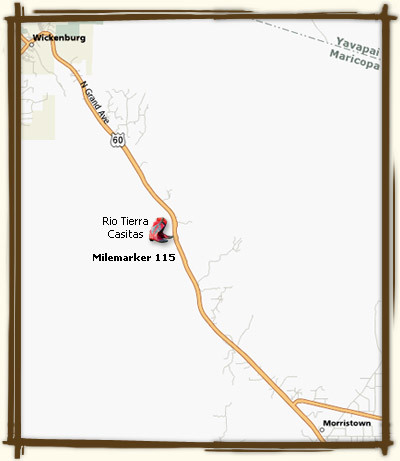 We are on the right, one mile past the Hassayampa River Preserve at milemarker 115. Look for the colorful banner on the right flying high atop the rocks. Turn right--at the red & yellow mailbox. PLEASE REMEMBER: ARIZONA DOES NOT CHANGE TO DAYLIGHT SAVINGS TIME (except on the Navajo Nation). WE WILL BE ON PACIFIC TIME DURING THE SPRING-SUMMER-FALL MONTHS, THEN ALIGN BACK WITH MOUNTAIN TIME DURING THE WINTER.